The Sokoke Cat Breed (or Sokoke Forest Cat in long form, and formerly the African Shorthair) is a natural breed of a domestic cat. The Sokoke Cat was standardized in the late 1970s from the feral cats of Kenya known as khadzonzo or kadzonzo. The Sokoke breed is characterized and named after the Arabuko Sokoke National Forest, where the breed was first started. The original Sokoke was breed for further breed development in Denmark and the United States. The Sokoke is a pure cat breed recognized by the four major cat registry organizations. The first Sokoke ever seen was found by a Kenyan farmer in 1978. This farmer, Jeni Slator, found a litter of these kittens in her coconut plantation. Jeni took these kittens home and adapted them as pets. She paired off two of the kittens and with her household staff and they hand reared the two kittens. Gloria Moeldrup was a fishing client of Jeni Slator. Gloria saw the cats and decided to move the breeding pair to Denmark. The two breeders, named “Jenny” and “Mzur”, had their first litter. In 1990, Gloria imported three more cats to strengthen the breeding stock. By this action, Gloria ensured the breed continuing. 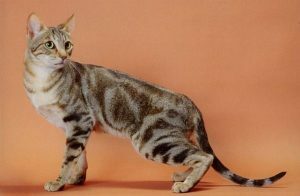 Today it is one of the rarest cat breeds on the planet. The Sokoke breed has the body size of a medium size domestic cat. The Sokoke breed is long and thin, having long legs. The breed walks with a stiff stride, primarily their back legs are longer than their front legs. Their eye color is amber to light green. Their head is a small size, with long ears. The Sokoke has a tapered tail. The Sokoke’s head resembles the structure of a wildcat. 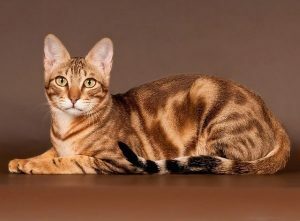 The Sokoke breed has a blotted spotted swirled (tabby) coat. Their coats are the shades of brown, giving the Sokoke a “salt and pepper look” in appear and coloring. This coloring and pattern extends all the way down to their tail. Even though their coat is similar to blocked patterns found in other tabby breeds, the Sokoke has distinct and unique features in coloring and pattern. The Sokoke coats are short in length, but the coat feels and looks lustrous. Some coat colors are black or near black, and blue colors. At this point, these colored coat Sokoke breeds are not accepted for showing by most registries. With the advent of these new color coatings, the Sokoke has shown marble type patterns, deviating from the traditional tabby patterns. The Sokoke breed is very active. They love to climb. Having a dominant personality, the Sokoke takes the lead when in their environment with other cats. They bond deeply to their owners and to other cats living with them. Since the attachment of the Sokoke breed for its owners is so strong, they have a difficult time adjusting to a new environment. Traditionally because of this, the Sokoke needs a longer time to bond to its new owners and get acclimated to its new environment. The Sokoke is best suited to a controlled environment. This breed does not fair well in extremely cold climates. The Sokoke can keep itself occupied for hours. The Sokoke prefers simple items to play with. The Sokoke is alert at all times, and if necessary will use its teeth and claws for defense if it feels threatened. This breed of cat does not like to sit in your lap. To show its affection, the Sokoke breed will follow its owners around the house. This breed does not shed a lot of hair. The coat of this breed needs to brush about once a week. Since the Sokoke breed can naturally swim and is not afraid of water, keeping the cat clean is not hard as other cat breeds. Common to the average lifespan of domestic cat, this breed usually lives about 15 years. – This breed loves to clatter and talk, they will purr to their owners for hours. – This breed responds effectively to training. – This breed of cat can be trained to walk on a leash. – This breed is highly active. – This breed is highly intelligent. – This breed can adjust to dwelling and living with other cats. – This breed can adjust to living around dogs. – This breed is noted overall as being a healthy breed.